Evidence of the seriousness of their mission is not hard to find. 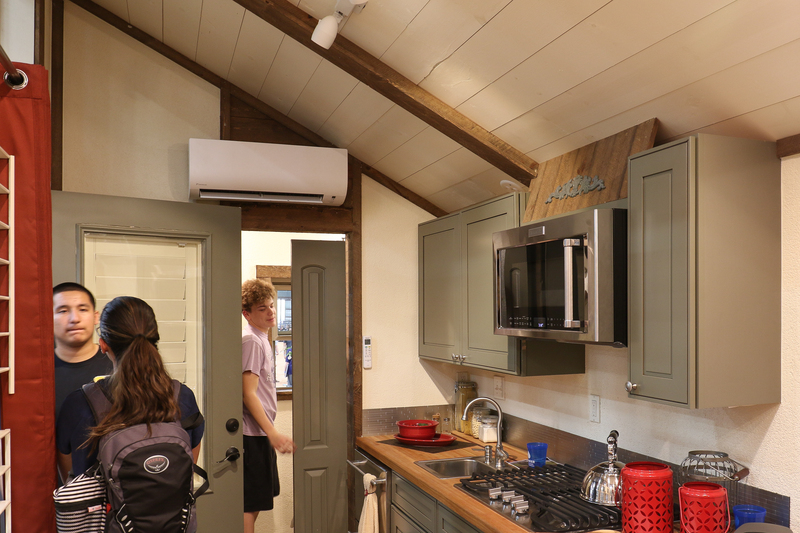 At the recent Rainwater Revival + Hill Country Living Festival in nearby Dripping Springs, Texas, the students had a prime example of their handiwork on display. In our walk-around video from that event, you can see the high level of design and build quality inherent in these scholarly tiny homes. More of these homes will be on display in the upcoming Tiny Homes Showcase on May 19, 2018, which will be held at the schoolyard just before the spring semester comes to a close. These homes are a maximum of 224 square feet, and are constructed on mobile custom trailers ranging from 20 to 20 feet. With a shell designed around 2×6 framing and spray foam insulation rated at R-25, the homes are energy efficient and feature integrated HVAC units, standing-seam metal roofs, solar arrays, and smart-home technology. And to make these homes an easy sell to area residents, the homes are fully compliant with San Antonio’s residential building code.